Breitbart has included a complete compendium, here. All of these outrages can be laid directly at Obama’s feet. The only reason he is getting away with it is because the media continues to largely give him a pass. The media needs to know how angry we are about their shameless cheerleading! But people are really fed up. Acts of defiance have sprouted up all over the country. Dozens of fishing guides in Florida’s Everglades planned to gather on the outskirts of the national park on Wednesday to protest its closing; who ever heard of closing bodies of water? These small acts of defiance, while encouraging, are only a prelude to what is coming. And then I want you to help “circle the wagons” on that day to help protect and defend our brave veterans who risked their lives for our freedom – and now are being barred from visiting the memorials erected to honor their deeds. 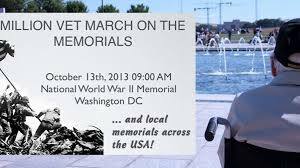 In a mean-spirited fit of selfish anger, Barack Obama has shut down our nation’s war memorials. And he has declared open war on our honored veterans! The World War II memorial … the Vietnam Veterans Memorial … the Korean War Veterans Memorial – Obama has shut them all down to force his will on the House of Representatives and frankly, to get revenge on the American people who oppose Obamacare and his other naked power grabs. Let’s put it plainly: Barack Obama is behaving like a vicious tyrant. And if he succeeds in this assault on the democratic system, the Republic we love is at mortal risk. It’s just that simple. Donate to the cause, HERE. Circle the date: October 13, 2013, and show up! Beginning Friday, October 11, 2013, independent long haul truckers are going on a nationwide strike. They will not haul freight anywhere. Instead, coming from all across the nation, truckers will clog the Washington, DC beltway for the first day of their three-day Ride for the Constitution.